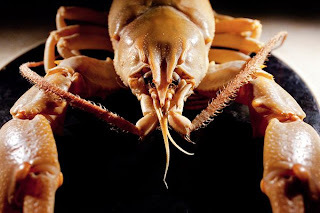 Recently, in Shoal Creek, Tennessee, researchers discovered a new, very large species of crayfish. 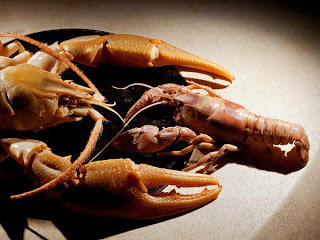 This crayfish, Barbicambasrus simmonsi, reaches a length of nearly five inches, is nearly twice the size of its local relatives, as you can see in this comparison shot. 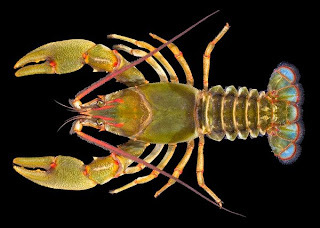 The crayfish is also noted for its unusual "bearded" antennae, called 'setae.' These fancy antennae give this guy enhanced sensory abilities. Pictures courtesy of National Geographic. Real question is: Do they taste as good as their smaller local relatives? That does seem to be a recurring theme among comments I've seen on these guys. No answer yet. Break out the butter and corn fritters!!! I would be interested to see if there is a population of the smaller species still in the area where this one was found. Do they compete or are they friendly with each other. Maybe it is evolution and they are following the trend that humans are taking.... being supersized!